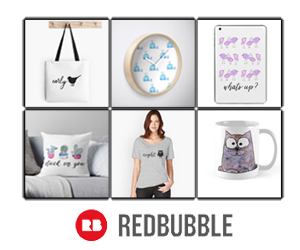 It was a few days ago when a short, unemotional press release popped up on my computer screen and brought my browsing to a jarring halt. It was hard for my brain to wrap itself around the news that Newman/Haas Racing, one of the long- time fixtures in American open-wheel racing, is closing its doors after 29 seasons in CART, Champ Car and the IZOD IndyCar Series. The team, owned by the unlikely duo of Chicago businessman Carl Haas and Oscar-winning actor and part-time racer Paul Newman, won 107 races and eight championships. Its list of drivers reads like a Who’s Who of racing stars, including Mario and Michael Andretti, Nigel Mansell, Paul Tracy, Cristiano da Matta, Sebastian Bourdais and Christian Fittipaldi. I covered many of those wins and all of the championships while writing auto racing for The Associated Press, and I got to know both Haas and Newman as people as well as car owners. 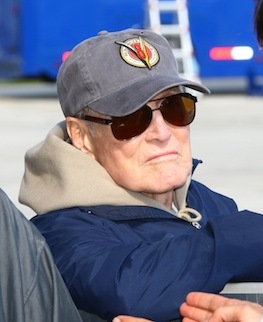 Late IndyCar team owner Paul Newman. the cigar-chewing millionaire didn’t come out on top of a business deal. He even made brief forays as an owner into Formula One and NASCAR, with limited success. But, at least in the case of F1, businessman Haas made a great up-front deal with his primary sponsor, Beatrice Foods, and wound up making money when the team folded. 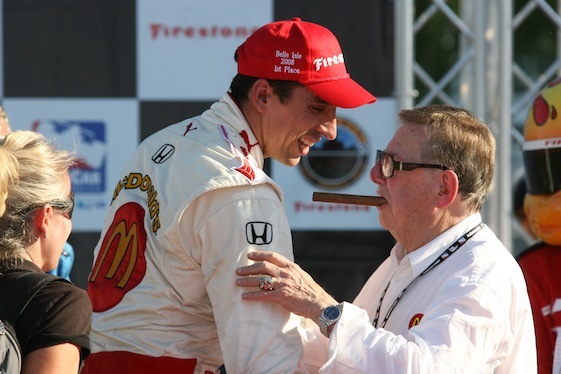 Haas, whose wife Bernie, has also been an integral part of the team, was perhaps best known for “blessing’’ his cars prior to races; making a circle of the cars, kneeling and touching their various parts with his unlit cigar while muttering supplications under his breath. Often, his prayers were answered with strong performances and numerous victories. Newman, who met Haas while the latter was racing successfully in Can-Am, became far more than the silent partner he had originally intended. Whenever he was not on a movie set or otherwise engaged in one of his many businesses, Newman was at the races. He wasn’t a gregarious person and usually sought to avoid the spotlight at the track, but Newman was totally involved in the team operation and was able to talk in great detail with the drivers, crew chiefs, engineers, tire guys as well as the people who cooked for the team’s hospitality motorhome. One day in talking with Newman, I asked him about his relationship with Haas. “Carl is the ultimate businessman,’’ Newman said after a few moments lost in thought. “He’s my friend, but I would not be in business with him unless I had confidence that he knew what he was doing and was successful at what he was doing. 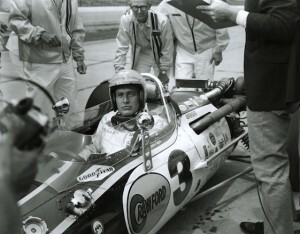 Paul Newman in the movie "Winning", which was filmed at Indianapolis Motor Speedway. A lot of people were starstruck by being around Newman, whose persona was bigger than life. Not Haas. “Paul likes to have fun but, when it comes to auto racing, he is all business,’’ Haas told me during an interview in 1988. “When we became partners, all he said to me was, `I want to win.’ That’s the way I feel, too. That philosophy never changed through nearly three decades, but the sport did. The team persevered through the hard times with CART and Champ Car, often dominating along the way. But the end of Champ Car and the move to IndyCar was the beginning of the end for Newman/Haas, coinciding with the death of Newman and a dearth of sponsorship. Finally, Haas decided to throw in the towel, and it’s a melancholy time for longtime open-wheel fans, including me. To paraphrase the late Bob Hope, thanks for the memories, Carl and Paul.